She scales a 20 meter high Chinar tree on a fire service ladder to assist an injured Barn Owl get back to its perch. Grabbing a poisonous snake by head, she releases the creature safely in the wild only to ensure that it doesn’t bite the people around. As a lone woman, she has often led an all-male entourage into highland pastures, trekking hostile terrains and scouting rare wildlife species. Meet the Kashmir’s very own version of Jeff Corwin and Bear Grylls. Srinagar-born Aaliya Mir is a fearsome adventurist. She heads a regional offshoot of Wildlife SOS, an international NGO which campaigns against animal abuse. Mir is a temerarious woman who negotiates sharp curves and the stubborn officials alike. She has engendered a network of volunteers across J&K who tip her off about incidents of animal plight requiring immediate intervention. With a highly skilled staff at her disposal, she entertains a complaint or a grievance and then runs off, in no time, to do the needful. “We work in collaboration with the Wildlife department of the J&K,” she says. 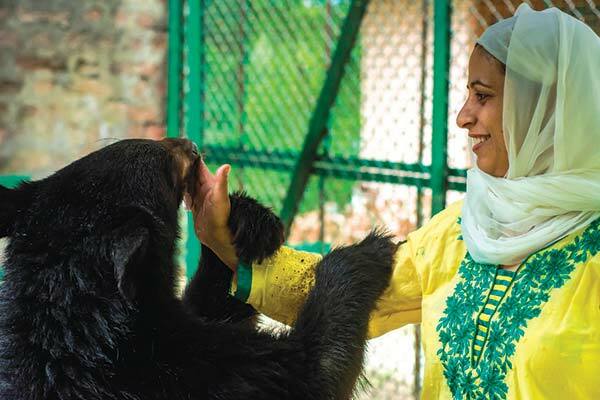 Since 2007, when her organization forayed into Kashmir, Mir has rescued and rehabilitated scores of animal and bird species from their natural or human-induced predicament. She also organizes excursions, trips and seminars to both explore and sensitize people about the significance of wildlife and ecology. People from nomadic Qalandar community in Delhi and elsewhere were known for parading bears before crowd who would throw coins at them in return. In the process, the owners would penetrate a sharp device through their nose and fasten a rope around it. Upon pulling the rope impulsively, the bears would flail their arms with pain – a gesture resembling dance moves. Hence, the dancing bears. The organization signed a Memorandum of Understanding with the J&K Wildlife department and is ever since authorized to work in close coordination with them. Her office is located inside Rescue and Rehab Centre, Dachigam. “Presently, we oversee the management at the rehab center,” she says. “We wash animals, look after them, feed them and even clean up their faeces,” she says. A post graduate in Mathematics and a former Physics teacher, Mir has studied at length about wildlife during her stint at the Delhi office of Wildlife SOS. Besides, she has also been a student of disaster management. She was born in 1978 in the Wazir Bagh area of Srinagar to a humble family. She did her schooling at Devki Aarya Putra Patshaala (DAPP) near Jawahar Nagar. 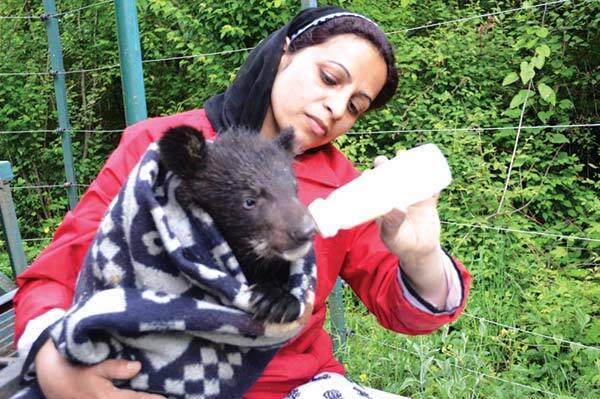 During the formative days of Wildlife SOS in Kashmir, Mir recalls, she had had a tryst with two bear cubs near Botanical garden. The mother bear was understood to have abandoned them. “She might have fled because authorities were furbishing the area to construct the garden,” she says. Aaliya Mir feeding a bear cub. After trying unsuccessfully to reunite them, Mir took cubs to the Rescue center at Dachigam and has been looking after them like a parent ever since. In fact, the cubs, which are now grown up and wear a ferocious canine-bearing appearance, are remarkably kind to Mir and rarely harm or bite her. She feeds them with her hands. “They cannot be released in the wild now,” she says. Why? Accustomed to hand-feeding, the animals are now unlikely to prey. Mir fears that in wild they would look out for humans expecting that they might feed them. But as happens in most cases, humans – anticipating danger from the “intruding” bears – raise false alarm, which often results in instances where the panic-stricken people kill them. “The bears are thus safe here,” she says. In another instance that happened last year, Mir had to rush to at least two homes in Srinagar, where inmates complained about a snake sticking its head out from the wall. “I immediately reached these places along with my team to sanitize them” she says. With sheer valiance, Mir caught the serpents by their head, incapacitating them and then releasing them far in the forests. 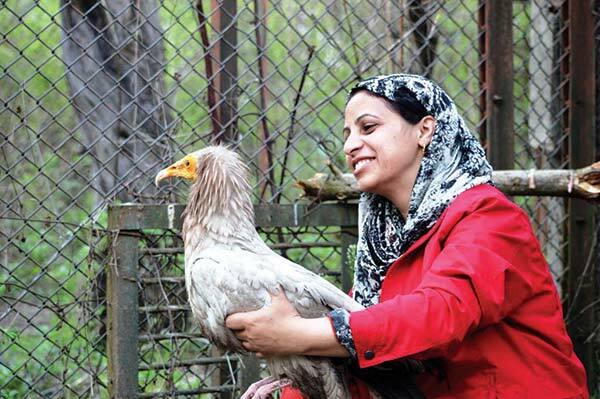 In days preceding floods, she had to literally plead with the Gujjar community residing in Ganderbal district who had caught hold of an injured Egyptian Vulture. Mir has two sons aged below ten. Her preoccupation with wildlife has led to her son grow up as science whiz. “He was able to distinguish between a Hangul and a spotted deer at the age of two which is quite extraordinary for a toddler of this age,” she says, beaming with excitement.